Picture yourself waking up to breathing views of the Tagus River? Relaxing in your comfortable home after a day of sight seeing? You get to relax in the comfy modern living room. Grab a book and chill out in style. Fashionable furnishings, lovely polished wooden floors, and large windows that let in plenty of natural light. We think it’s perfect for couples or small families. It's a peaceful neighborhood with cute cafes nearby to explore, and you'll be within walking distance of the river. Sweet. The living room is sunny and beautifully decorated with art work and bright furniture. The flat is spacious and has ample storage. You'll be 15-minutes walk to the river front. You wont have any AC to keep cool in the hotter months – the perfect excuse for a riverside stroll. “I loved this property. It’s been completely renovated and has pretty views of red tile roofs and the river." 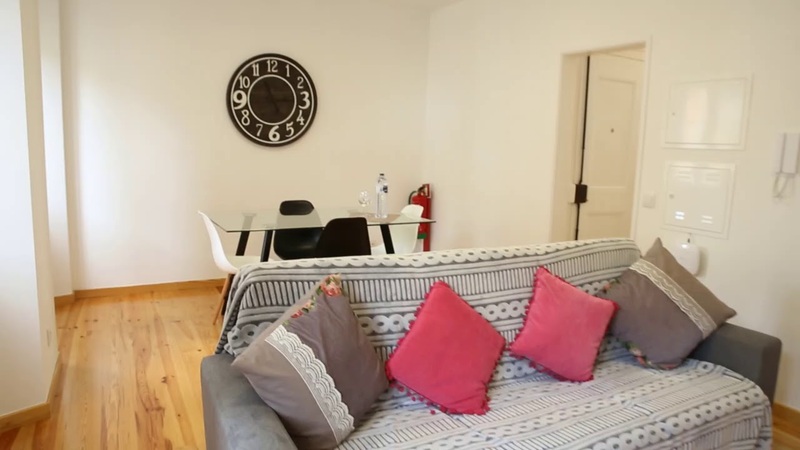 This is a lovely 2nd floor, 2-bedroom apartment on Calçada Dos Barbadinhos, Lisbon. It boasts lovely decor, 2 double bedrooms, and amazing views of the river. We think this apartment is perfect for a couple or small family looking for a tranquil spot out of the city hustle. You'll have the river nearby, and plenty of local cafes and restaurants to enjoy. Curling up on the comfy sofa with a book – the lovely room is the perfect place to relax. Unpacking all of your belongings – there's a storage room off the kitchen perfect for those extra items. Walking to the riverfront – it's only 15 minutes away and the stroll is so pretty. The apartment is on the 2nd floor and there is no elevator. Don't worry, this beauty is worth the climb.